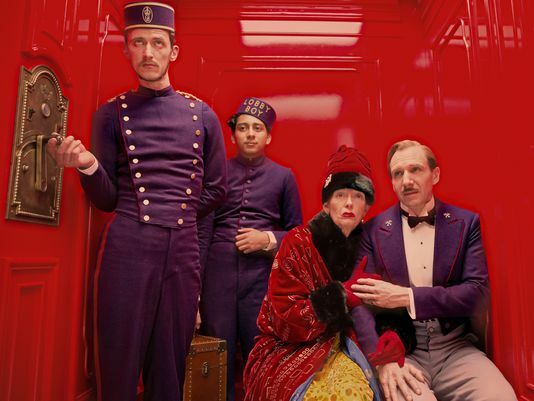 After receiving nine Academy Awards nominations, The Grand Budapest Hotel builds upon its success as Wes Anderson’s highest-grossing film returns to theaters, hoping to introduce the quirky murder mystery to new moviegoers, and possibly win a few more awards, as well. Funny, bizarre and outrageous, are only a few words that perfectly describe this crime-caper whodunit, which is also very good. Fanboys of Writer-Director Anderson have come to expect this sort of accomplishment, but for the very first time, his film is garnering critical and commercial success. Maybe it’s because the film features a cast that includes four Oscar winners, along with 11 others nominated for the award. Maybe it’s the intricate layers of stories within stories that untangle as the movie unspools, fully enjoyed after multiple viewings. Or maybe it’s simply because the movie is fun to watch. Inspired by the writings of Stefan Zweig, Anderson presents a legendary hotel concierge (Ralph Fiennes) framed for murdering his aging love interest (Tilda Swinton practically unrecognizable as an elderly European aristocrat) and the steps he and his Lobby Boy (Tony Revolori) will take to prove his innocence. The hero of the story is just like the women he loves: insecure, vain, superficial, blond, needy, and in the end, rich. How he gets to that conclusion is an incredible ride. Although there are an incredible number of great actors on display — many with only bit parts — it is Fiennes’ dry wit, perfect comedic timing and incredible formality (even while cursing) that makes performance stand out among all the rest. He totally encompasses himself in every way possible as the concierge. For that reason, alone, I can’t believe he’s never won the Best Actor Oscar before. Snubbing him a nomination for this movie was unbelievable. Full Disclosure: I’ve been a fan of Wes Anderson’s films for a long time. Although each of his films offer unique storylines (even though many of the same actors tend to show up), Rushmore was my all-time favorite. However, after watching this one, I may have to reconsider that top spot. With the additional exposure of winning the Golden Globe for Best Film – Musical or Comedy — among all the other awards — this movie is showcasing Anderson’s talents to a wider audience than ever before. Fans have waited a long time for him to finally receive recognition in Hollywood. In years past, this type of movie would never have won the Oscar for best picture or best director, being regulated to the best-writing award, if that. But with many critics stating this year’s nominated films are a weak bunch, the time might be right for the unthinkable: Wes Anderson winning one (or more) Oscars! If there’s any justice in this world, Anderson will win Best Director and the movie will win Best Picture, but most likely, it’ll only win Best Original Screenplay, Best Cinematography and Best Makeup and Hair awards. Here’s to hoping the movie gets more exposure and becomes a major award winner this year. Strength: Incredible cast, great style and intriguing story within a story. Weakness: Quirkiness may be a turn-off factor. WTF Moment: I didn’t fully comprehend the epilogue and prologue until watching a second viewing of the film.